Cecily’s heart thumped and her own fingertips began to tingle with a sudden jolt of adrenaline that coursed through her at the shock of recognition. The woman stopped talking, as if aware that guests had joined them in the room. She began to turn, revealing a creamy bronze face, and just a hint of freckles sprinkled across prominent cheek bones like a fine dusting of cinnamon. Her eyes shone with the brilliant blue of an Alaskan glacier in the afternoon sun. In truth, the room was drenched in shadows and not a single detail of the woman’s appearance was the slightest bit visible. It didn’t have to be. Cecily saw it all vividly in her mind just the same. She knew without a doubt, once she managed to will her heart to stop racing and forced her eyes to look up, that the face looking back at her would most certainly belong to Rorie Mulloy. Cecily silently cursed her luck. What were the odds? The very first time since college that she’d dared to venture backstage at a theater, and she found herself face to face with the reason she’d left in the first place. 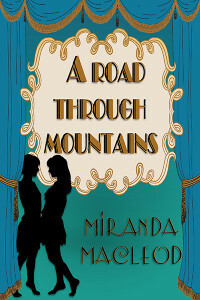 Miranda lives in New England and writes heartfelt lesbian romances featuring witty and charmingly flawed women that you’ll want to marry. Or just grab a coffee with, if that’s more your thing. She is an avid reader and a good cook, and loves to travel. Before becoming a writer, she spent way too many years in graduate school and has worked as a temp in just about every office building in downtown Boston at one time or another.